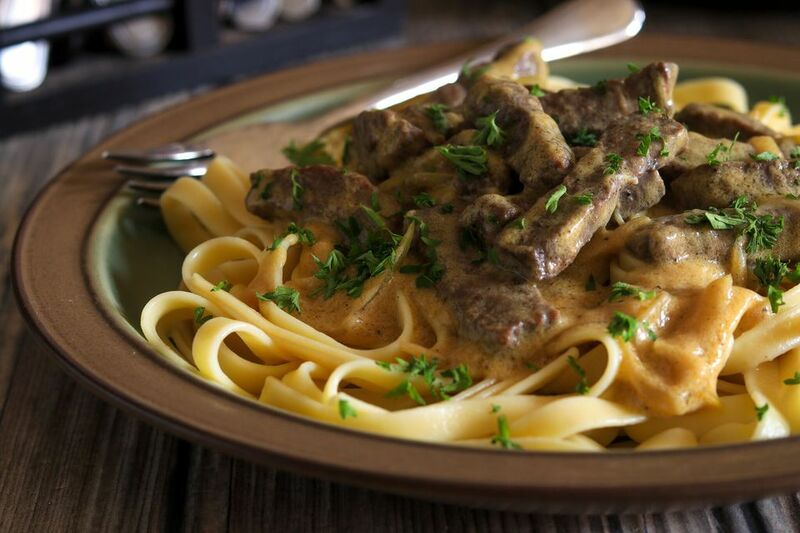 Make this delicious beef stroganoff and serve it with hot buttered noodles, rice, or potatoes. Add a basic tossed salad or side vegetable for a tasty, satisfying meal. Created using a simple skillet, this version still maintains all the classic flavors of the traditional dish. We recommend serving it with potatoes or over split buttered biscuits. A sprinkling of fresh chopped parsley or chives adds color and flavor to the stroganoff. As do sauteed mushrooms. See the tips and variations below the recipe for additional ideas, and some tips for increasing the sauce and sour cream. Cut beef into narrow 2-inch long strips about 1/2-inch thick. Sprinkle meat with salt and pepper and set aside. Melt 1 tablespoon butter in a medium saucepan. Blend in flour and cook, stirring constantly, for 2 minutes. Gradually stir in beef broth, stirring and cooking until thickened and smooth. Heat remaining 1 tablespoon of butter and 1 tablespoon olive oil in a skillet or sauté pan over medium heat; add the onions and cook, stirring, until the onions are just tender. Add the meat strips and quickly brown on all sides. Add the beef and onions to the thickened beef sauce. Cover and cook on low for 10 minutes; stir in sour cream and heat through, but do not boil. Arrange the beef stroganoff on a platter over buttered noodles or hot cooked rice and garnish with the fresh chopped parsley. It may be served with mashed potatoes as well. Add a tossed green salad or steamed broccoli for a delicious and satisfying family meal. While this recipe calls for tender top sirloin, you may use another tender cut. Tenderloin is pricey, but it is excellent in stroganoff. Avoid overcooking the tender beef sirloin or tenderloin. If you happen use a tougher cut of beef, just make note that it will need more simmering time. Add about 4 to 6 ounces of sliced fresh mushrooms and an extra tablespoon of butter or olive oil to the skillet along with the onions. Add 1 clove of finely minced garlic to the same skillet used for cooking the beef. Saute for about 2 minutes; add to the beef and sauce mixture. Alternatively, add about 1/2 teaspoon of garlic powder to the sauce mixture. For extra an extra saucy stroganoff, increase the flour to 2 tablespoons and increase the beef broth to 1 1/2 cups. Double the sour cream to 6 tablespoons. Instead of parsley, garnish the stroganoff with thinly sliced fresh chives or green onion tops.